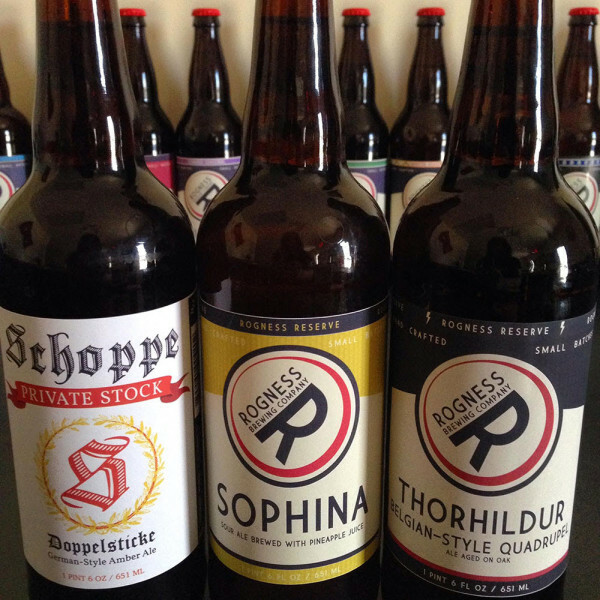 (Pflugerville, TX) – Since Rogness Brewing‘s successful 3rd anniversary party where we debuted Schoppe Private Stock Doppelsticke, we have released two additional beers in the Rogness Reserve series. These beers are available in both bottle and on draft in Houston, Dallas, Fort Worth, San Antonio, and surrounding areas. If you live in the Austin area, however, you will only find them on tap at the brewery. First up is Sophina, the first sour mash beer we have done. We added acidulated malt to the mash for an extended period of time and a lower temperature than normal to foster lactobacillus growth and reduce the pH. Then we added pineapple juice after fermentation was complete. This provides a pleasant and almost tropical fruitiness that is further complemented by Mosaic hops added late during the boil. Next up is Thorhildur, a Belgian-style quadrupel aged on oak chips and oak cubes. Thorhildur is named after Diane Rogness’s mother, who is of Icelandic descent but lives locally. She has battled ovarian cancer for over 3 years and endured more than 80 chemo treatments. Coming in at just over 10% ABV, we were inspired to create a strong beer to honor a strong woman. And just like its namesake, it is sure to age well.